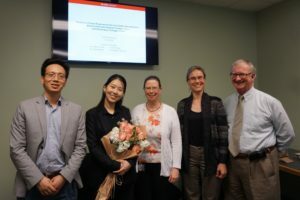 On Friday, April 20, Fan Zhang passed the oral examination for her Master of Science in Textile Engineering degree with a minor in Biomedical Engineering! 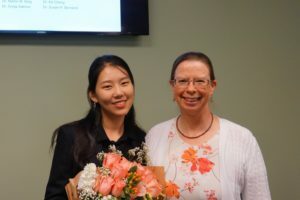 She really impressed the members of her examining committee (Dr. Ke Cheng, Dr. Susan Bernacki, Dr. Sonja Salmon, and Dr. King) with a very clear oral presentation, and answered the judges’ many questions with well thought out and knowledgeable responses. 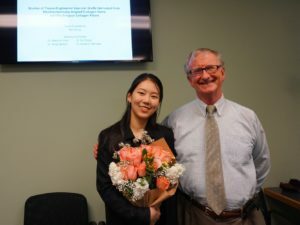 In fact, the examining committee criticized Fan for not stressing the uniquely successful accomplishments of her research project, given that she is the very first person to use knitted collagen yarns in a vascular tissue engineering scaffold. Well done Fan!! 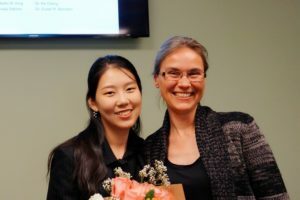 We are really proud of you and what you have accomplished in a short space of time!! BMT’s Journey to the SFB Annual Meeting! 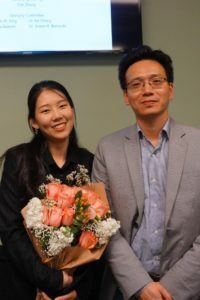 Congratulations Fan Zhao! !